If you ever package users from one Sitecore instance to another you will find that upon install the users are disabled and the passwords need to be reset. What if you were moving them from one version to another and need to keep the same passwords? Fear not, just run this SQL script. It will update the passwords of all matching usernames to the original passwords, and enable the accounts. The databases must be on the same instance. SELECT Upgraded Core DB in SQL Studio. First run the SELECT only to see what it's going to do, then run the update script. --comment = ou.username,    -- TEST! 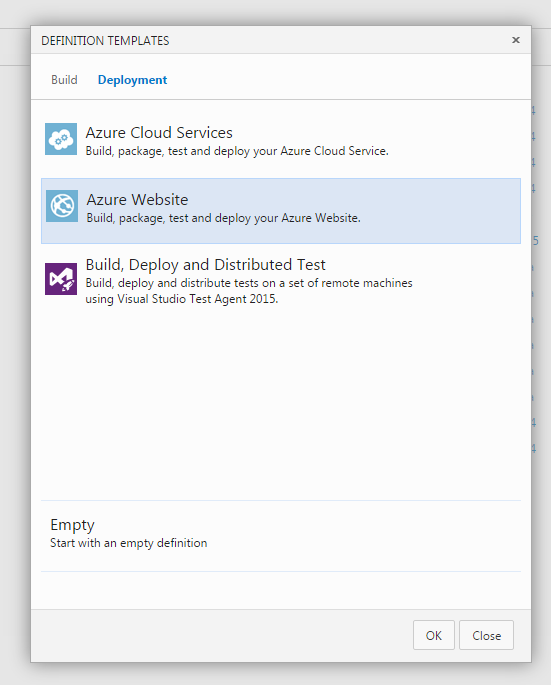 If you’ve tried the ‘new scriptable build system’ on Visual Studio Online and you use the wizard to set up an Azure Website build/deployment you might find that by default it will delete any existing files/folder upon deployment. If you rely on any uploaded app_data files etc being kept in the wwwroot you might want to disable this. Otherwise it will delete existing files! I recently posted a short introduction to the Sitecore FXM on the e3 blog, below is a more detailed version! 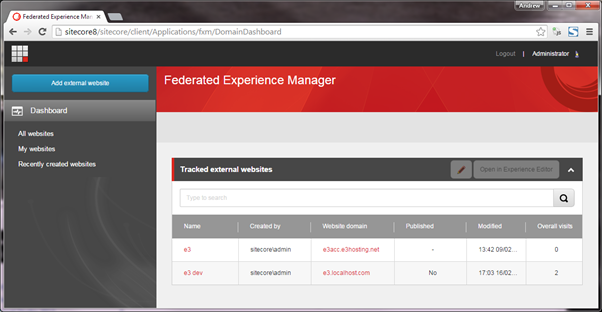 One new feature in Sitecore 8 is the Federated Experience Manager (FXM). 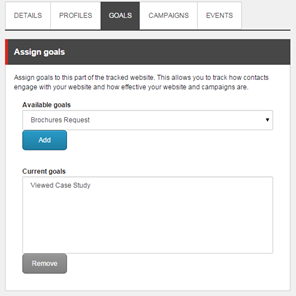 This is a brand new tool designed to allow you to apply Sitecore’s marketing features to existing non-Sitecore sites. This would be ideal for clients who are investing in the Sitecore platform but also have legacy sites which aren’t being redeveloped into Sitecore. 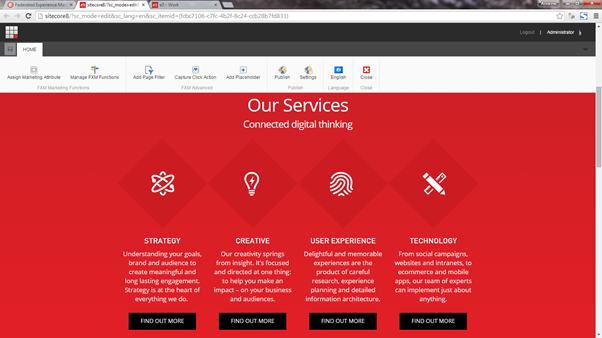 For example, associated WordPress blogs, Drupal communities, even flat microsites could contribute to a user’s Sitecore Experience profile and affect personalisation across all these sites. I’ve had a chance to experiment with this tool and this is what I found. 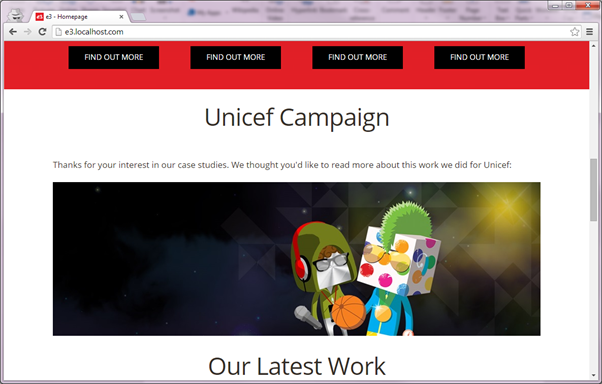 As a basic example, we could trigger a goal when a user views a case study and then display a personalised block on the homepage to highlight a particular case study, such as this one about Unicef Launchpad. The following personalisation settings will show the custom content if the user has viewed a case study, otherwise hide the component. 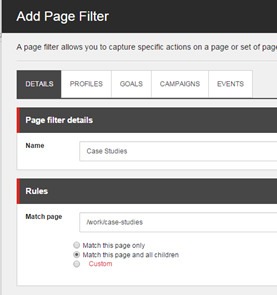 You could add multiple conditions in here to display different content depending on the user’s activity. There are many possibilities in terms of the personalisation logic you could apply, and this new ability to apply marketing features to external sites really adds a new dimension to Sitecore’s experience platform. We wanted a simple way to get a new environment set up on a developer machine, but without the hassle of Virtual Machines. This lets you manipulate IIS7 via command line calls. 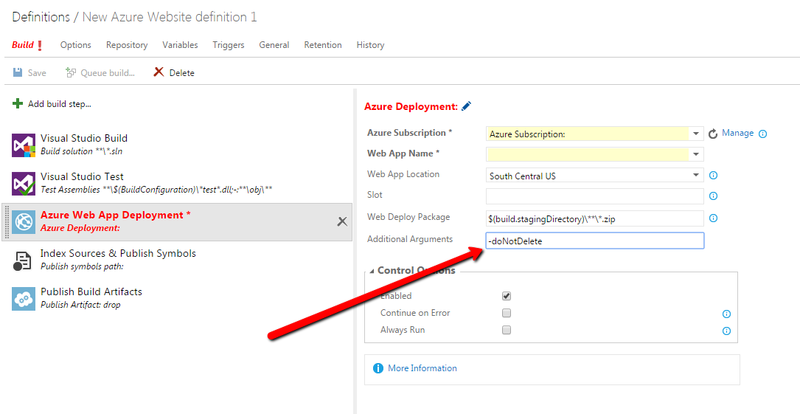 There is lots of documentation on the IIS site but it takes a while to figure out which commands you need to do everything to set up a site. So I’ve put together a selection of the useful commands below in a sample site setup script. We save these as batch files (.bat) and put them in a shared folder. Put this in a .bat file and save in a shared folder. Keep as many steps as required, and replace the relevant placeholders. To run, right click Run as Administrator. "C:\Program Files\7-Zip\7z" x -y "PATH_TO_SITECORE_ZIPS\Sitecore 7.0 rev. 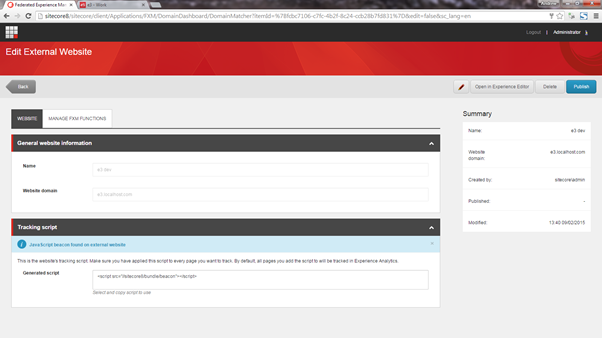 140120.zip" -oc:\PATH_TO_TRUNK "Sitecore 7.0 rev. 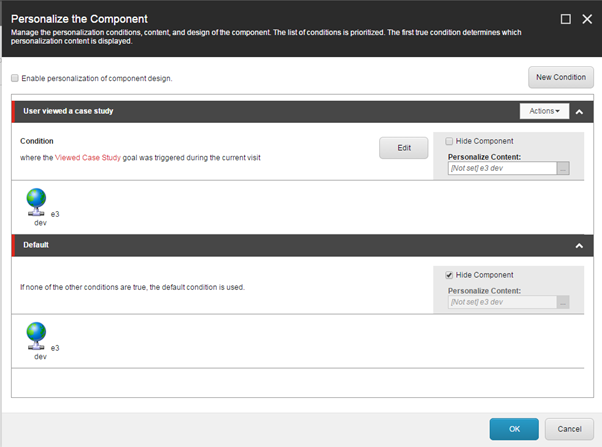 140120\Data" "Sitecore 7.0 rev. 140120\Website"
Hope that’s helpful to someone! Our QA team have started creating Selenium scripts to automate browser functional testing. These allow us to automatically run through a set of actions on a website and flag up any issues. Download Selenium Server from http://www.seleniumhq.org/download/ and store the .jar somewhere you can run it from. Click Run All. Selenium Server should log the commands and launch Firefox to run the test. Run the test, screenshot should be saved into the Screenshots folder with same name as the test class. Set the Artifact paths setting on the build settings to point to the Screenshots folder to save the screenshots after each run. To run via TeamCity the Selenium server must be running. You could start this manually same as above, hopefully this can be made to run automatically as a service but I’m not sure how. Each test must be independent of any other as they may be run in any order, or perhaps only failed tests might be run. Also the server will restart the browser between each test so they can’t depend on the final state of the previous script (like they can in the IDE). We’re going to try using New Relic Synthetics which has a feature for test automation – apparently you can upload a Selenium script and it can automatically run as and when, we have yet to try this out though! Could not load file or assembly ‘System.Web.Http, Version=4.0.0.0, Culture=neutral, PublicKeyToken=31bf3856ad364e35’ or one of its dependencies. The system cannot find the file specified. The fix for this was to find the reference in the website project and set copy local False then True. It’s missing a <private>True</private> flag in the project file. If you get an issue like this I suggest you compare the bin folder vs your local site and see if anything’s missing. Worth doing as well. 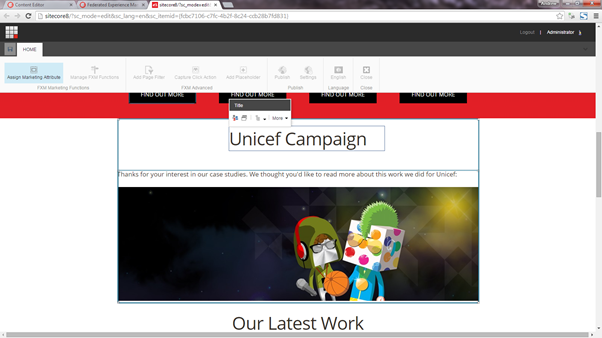 After this I also had to set copy local False/True on System.Web.Mvc to get the latest MVC dll to copy in. We wanted to hide the address fields until you select the address from the postcode lookup. As this isn’t documented anywhere on their site I thought I would post it in case anyone else needs to know how to do this! This project references NuGet package(s) that are missing on this computer. Enable NuGet Package Restore to download them. For more information, see http://go.microsoft.com/fwlink/?LinkID=322105. The missing file is ..\packages\UmbracoCms.7.1.4\build\UmbracoCms.props. 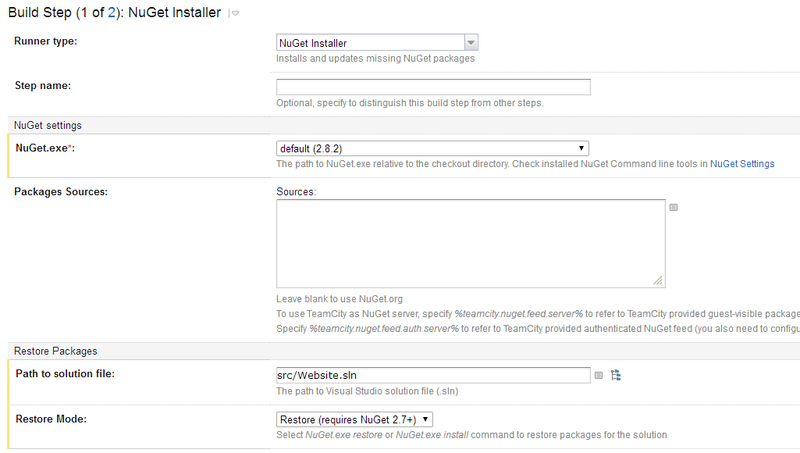 But, how to enable NuGet Package Restore on TeamCity? UPDATE: It seems this is as easy as in Visual Studio, right click the solution and Enable Nuget Package Restore for Solution. I’m sure I tried this before and it didn’t work, but it seems to now! All I specified is the NuGet version, path to solution file and Restore mode. The first time you do this no default NuGet version will exist so you have to click NuGet Settings link and Fetch the latest version of NuGet. Note that after this your build agents will disconnect to install the NuGet version. Then your build should succeed! Awesome! This allows you to set the Data source for the component. If you have some components that require a data source and others that do not, it can be confusing for editors because the Set associated content button is always visible. The only way to see if it is intended to be used in a particular instance is by clicking it and seeing whether the developer has set the restrictions – if not then it allows you to pick any item from the whole site tree and you realise you probably aren’t meant to use it. I thought it would be nice to only show the button if the Template restriction has been set, so the editor doesn’t try to use it when it isn’t intended. Then the button will only show up if a Datasource Template has been assigned. 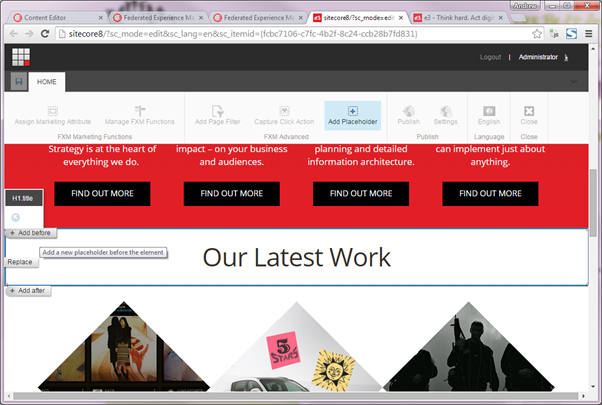 I wanted to get an overview of all the templates in a Sitecore project along with how many times each has been used. I thought there might be some marketplace module for doing this but couldn’t find one, nor could I find a suitable report in the ASR module.